Welcome to The Flower Stand – your source for locally grown, sustainable, fresh cut flowers. We grow florist grade flowers that are typically hard to get. Our farm is located 2 miles north of the Village of Springville on Route 240 (Vaughn St.) in Erie County. From June through the first frost of October we are open daily on a self-serve basis or by appointment. We start late in May or early June with a pre-picked display of rhubarb and perennials and gradually work our way up to a beautiful array of farm fresh flowers. At the peak of the summer of 2017 season, our farm had 127 varieties of annual and perennial flowers. Locally grown specialty cut flower bouquets are breathtakingly beautiful. You know where they come from and who to come back to for more. *Wedding and Event Flowers ~ We work on a “first come” basis, please book your wedding as early as possible. *What Blooms When ~ a Best Guess list of the what and when of our flower crop can be found through picture posts on the Facebook page. Many things determine bloom times of the flowers we grow. Sunshine, rain and the temperature are out of our control, please be aware that farm fresh blooms come on Nature’s timetable. Contact us in advance if you’re looking for something specific for an event. I will do my best to keep this page updated with what is in bloom and available. The Flower Stand is run by me, Ellen, together with my husband Jon Krzemien. We continue the family tradition of farming the same land my family has farmed since the 1930’s. We are specialty growers of cut flowers. We dabble in a variety of herbs, rhubarb, blueberries, garlic and more. 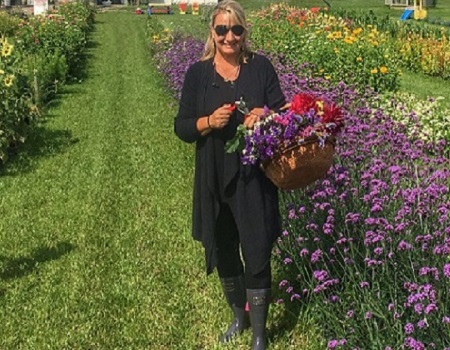 It’s a joy to be able to provide you with fresh cut flowers from our farm to your home or special event. Thank you for the opportunity to provide you with locally grown, fresh cut flowers in beautiful lots in vibrant and amazing colors.